Armoured mayfly Baetisca obesa, photographed by Jason Neuswanger. Mayflies have occasionally put in an appearance here at CoO, most notably in an earlier post where I explained how the one thing that everyone 'knows' about mayflies is simply not true. 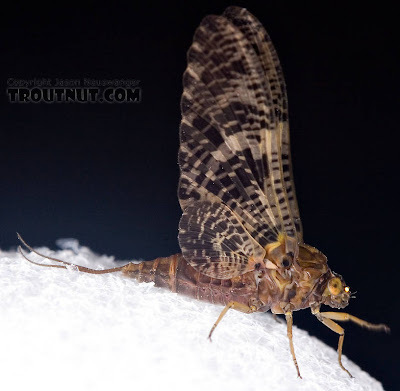 In this post, I thought that I'd look briefly at the fossil context of mayflies. 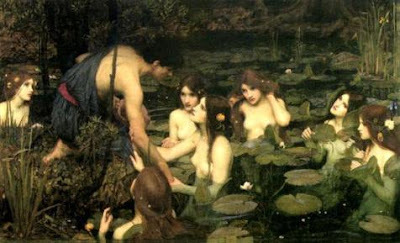 Hylas and the Nymphs, by John William Waterhouse, in which our hero is fatally tempted by a septet of skinnydipping broads. Drunella cornuta, photographed by Jonas Insinga. Which I'm sure came as something of a disappointment to Hylas (though, of course, had Hylas been more disappointed, he may have also been less dead). 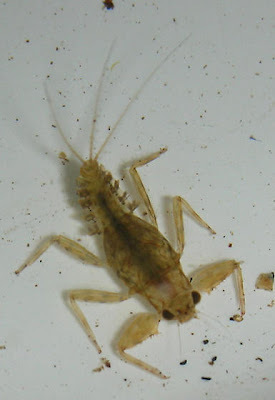 As discussed in an earlier post on stoneflies, there is some uncertainty whether aquatic nymphs are ancestral or derived for winged insects. However, mayflies were spending the first part of their lives in water by at least the Permian (Kluge & Sinitshenkova 2002; Grimaldi & Engel 2005). Representatives of the mayfly crown group (i.e. the group stemming from the most recent common ancestor of all living mayflies) are not known until the Jurassic; earlier species all belong to the stem group. The Carboniferous Syntonopterodea may also be stem-mayflies, but in superficial appearance the large, broad-winged syntonopterodeans may have looked more like the contemporary palaeodictyopteroids. Reconstruction of Protereisma permianum, one of the best known of the Permian stem-mayflies, via here. The Permian and Jurassic Ephemeroptera themselves had some notable differences from crown-group mayflies. 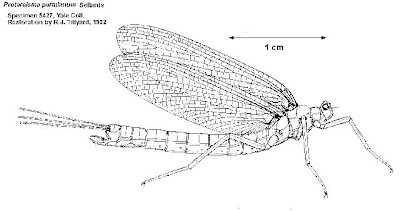 Modern mayflies have heteronomous wings, with the fore- and hind wings differing in size (in some mayflies, the hind wings have almost disappeared entirely). Permian mayflies, in contrast, had homonomous wings, with the two pairs more or less identical; the hind wings became shortened in Triassic stem-mayflies (Grimaldi & Engel 2005). At least some stem-mayflies also retained well-developed mouthparts as adults; this suggests that they may well have lived longer as adults than modern mayflies. While Grimaldi & Engel (2005) included Permian and Triassic species in the Ephemeroptera, Staniczek et al. (2011) restricted that name to the crown group and its nearest and dearest, placing most of Grimaldi & Engel's stem-group 'Ephemeroptera' into an extinct clade Permoplectoptera. Kluge, N. Yu., & N. D. Sinitshenkova. 2002. Order Ephemerida Latreille, 1810. The true mayflies (=Ephemeroptera Hyatt et Arms, 1891 (s. l.); =Euephemeroptera Kluge, 2000. In History of Insects (A. P. Rasnitsyn & D. L. J. Quicke, eds) pp. 89-97. Kluwer Academic Publishers: Dordrecht. Staniczek, A. H., G. Bechly & R. J. Godunko. 2011. Coxoplectoptera, a new fossil order of Palaeoptera (Arthropoda: Insecta), with comments on the phylogeny of the stem group of mayflies (Ephemeroptera). Insect Systematics and Evolution 42: 101-138.